"A dripping wet canvas covered the entire floor. . . There was complete silence. 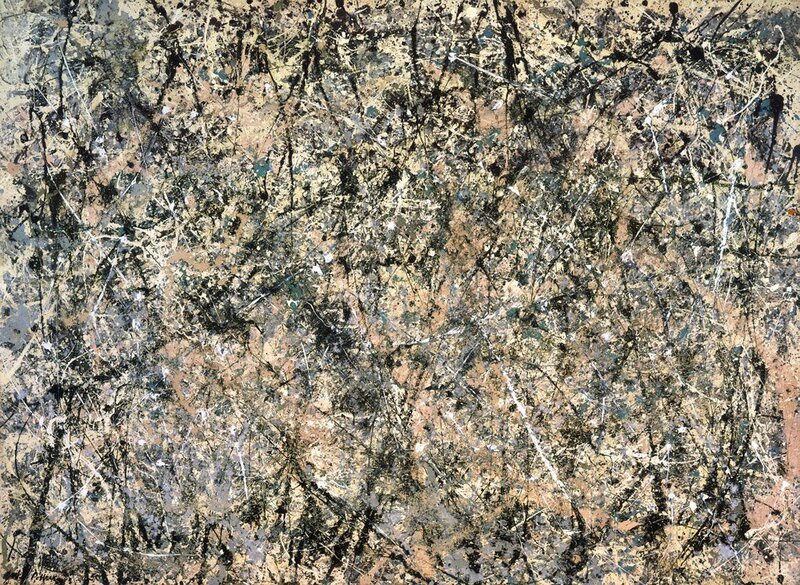 . . Pollock looked at the painting. Then, unexpectedly, he picked up can and paint brush and started to move around the canvas. It was as if he suddenly realized the painting was not finished. His movements, slow at first, gradually became faster and more dance like as he flung black, white, and rust colored paint onto the canvas. He completely forgot that Lee and I were there... My photography session lasted as long as he kept painting, perhaps half an hour. In all that time, Pollock did not stop. How could one keep up this level of activity? Finally, he said 'This is it.'" That was your educational tidbit for the day. I had to introduce his works in order for you to comprehend how he has influenced the fashion world (with his unique methods, and masterpieces). 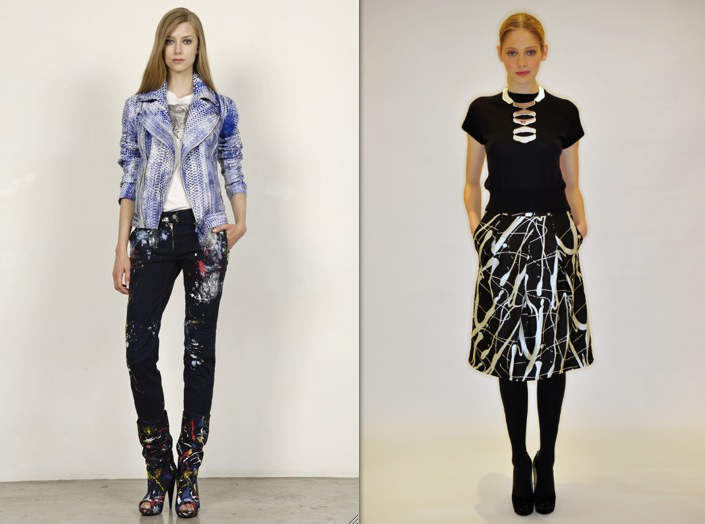 The following few collections were inspired by Jackson Pollock. You, the readers, would be interested in weekly beauty posts? I just started a new skin regime that cleared me up pretty well, and I'd love to share the info if you'd like. You guys know I'm obsessed with dermatology, so it would be my pleasure to enlighten you with some beneficial information. but you can't change your skin. Take care of it please. Chantelle, I absolutely LOVE your blog! I discovered it a few days ago and actually went back and read it from the beginning. It's so cool that you do hip hop (me too, and I love it)! Your blog has a certain quality (unique, characteristic) that sets it apart from so many others out there. You really have great taste, and I praise you for writing about wordly issues and art, alongside fashion and beauty. You've inspired me to update my blog again. Speaking of which, your question comes at the perfect time. I would love more beauty posts. Clear skin is something I strive for. Anyway, keep up the great work. I will be commenting. ahh, my respect for you has just gone up majorly. and i already had a lot of respect for you because of your fabulous bloggings. jackson pollock is one of my all time favourite artists. it is a desire of mine to see a gallery of his works and actually appreciate the sheer size of his pieces. i was so happy to read your post about him, and i look forward to your next postages, hoping they will be just as brilliant. Pollock is one of my favourites. Great post. Pollock was an amazing artist! And McQueen too! love the collection, is great!! The two D&G pics are absolutely STUNNING!!!! Fabulous post! gorgeous, gorgeous, i just lvoe this art! and ps, youve been tagged! The Dolce and Gabbana dresses are absolutely fabulous! I really like your blog! It was weird, during this test I took, it was telling me a story about Pollock. 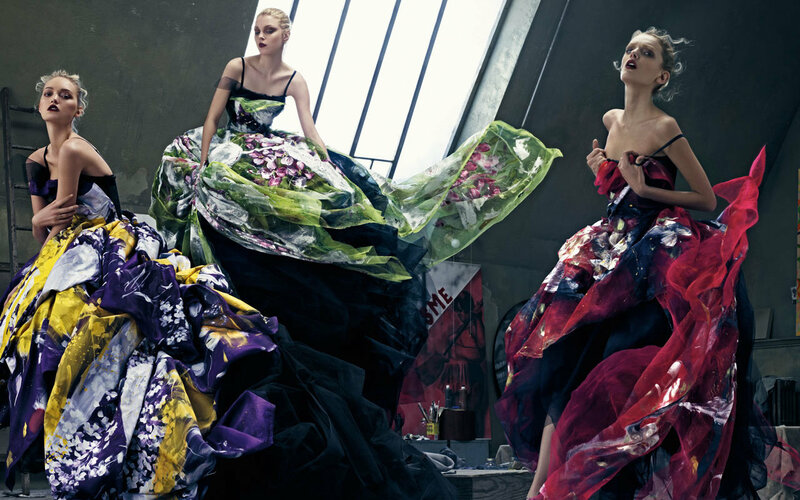 Either way, those dresses are clearly inspired by that sort of splatter kind of painting. It's amazing how the dresses don't look "crafty" at all. he's an effing genius. i love him. i've seen a lot of his works in the city. my mom is obsessed with him because she's an art major fron seoul. it's kind of scary how much about art she knows. we're always going to art shows. yes..would like some beauty posts! 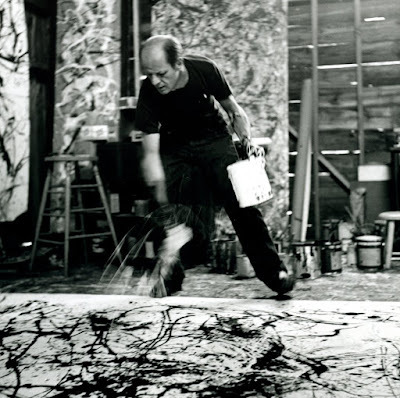 jackson pollock is so incredibly fantastic! I've been lovin' me some Pollock for quite a while now, but I'm always happy when his work vibrates into unexpected places, like today, with your blog. I love him! I remember just sitting and staring in awe when I saw one of his painting a couple of years ago! hi there! i was an art history major in college and did my senior thesis on jackson pollock's psychoanalytic drawings....and also got engaged at his house in east hampton...so he is very dear to my heart, and i'm so happy to see a post about him on a fashion blog! I have the first generation of iphone and i can barely hear the ringtone when people call me!